Performance - Hot Rods - Custom - Antiques - One Offs Many with Valid Race and Movie Build Histories. Please enjoy what many have said to be one of the largest dealership owned antique automobile collections in the Southwest if not the Nation. This unusual mixture of models and manufacturers represents some of the most eclectic Antique, Restorable, Vintage, Classic, Racing, One-Offs and Celebrity associated cars and trucks offered under one roof. 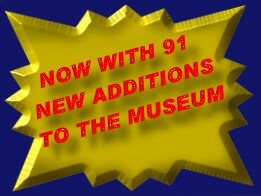 Please grab a cup of coffee, sit back and enjoy any or all of the approximat 375 +/- vehicles that await and more are being added daily. Just make your selection from one of our menus above and enjoy your stay at the Pack Automotive Museum and the history associated with it. By the way, on one of the pages is a link to a "You've Won" Page. There will only be 1 winner and if you find that link please follow the instructions carefully and win a personal tour of this fantastic collection. You must be 18 or older to win, present a valid driver's license upon arrival on the pre-arranged day and time of the tour. GOOD LUCK, now enjoy this web site.